Synths versus guitars. Ever since Miracle hit the web it’s been the question on every Hurts fan’s lips in anticipation for ‘Exile’, the band’s second album. But can we really berate a band for progressing, for trying something new? Synths may seem integral to Hurts' 80s aesthetic, but it’s melodrama that’s at the heart of their sound. Whatever the instrumentation, ‘Exile’ has melodrama in spades: from the grating, Muse-esque title track, to the grandiose chorus of Miracle, the children’s chorus of Sandman and the chorus lyric of Blind (“Cut out my eyes and leave me blind”). And that’s just the first four tracks, not forgetting the blazing guitars of Cupid, the pounding dubstep of Mercy or the apocalyptic Somebody To Die For, amongst the fourteen tracks of the deluxe edition. Yet every good drama needs comedy and tragedy, light and shade. ‘Exile’ does contain some quieter moments, namely the mournful The Crow with its moody vocals and pizzicato strings, and piano-ballad Guilt that closes the album. Elsewhere, though, the sound is consistently big. Vocal melodies soar above pulsating basslines, thumping industrial beats and a tumultuous crash of synths and guitars. Individually, each track offers euphoric blasts of goth-pop filled with anthemic choruses, catchy hooks and glossy production, the sort of songs that can only be accompanied by elemental videos and tempestuous wind-machines. 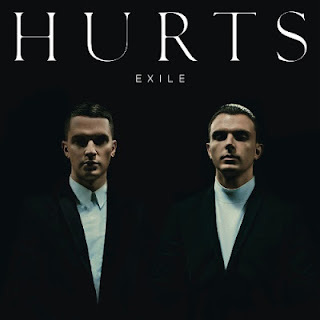 As a complete album, however, ‘Exile’ is just too one-dimensional; a relentless pounding to the ears with no let-up, straining under the weight of its own despair. The result is an album that lacks variety, turning Hurts’ music into a formulaic barrage of crescendos, emo lyrics and epic choruses. What they do, they do very well, but sadly nothing here triumphs over the band’s excellent debut. Listen: 'Exile' is available now. Watch: Hurts are touring Europe in March and April.